Our favorite Fall party ideas all on one page – Fall / Autumn themed party games, activities, party themes, scavenger hunts and more! 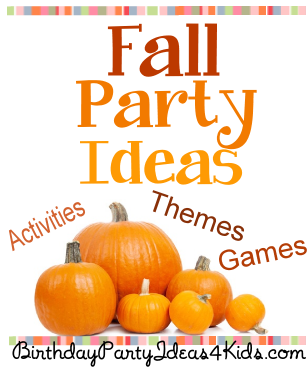 If you have a party that you are planning for kids, tweens or teens in the Fall our party ideas will make the party planning easy! Fun, cheap and easy party games, minute to win it style games with a Fall theme, Scavenger hunts (with free lists!) and lots of great Fall activities to keep everyone involved and enjoying the party! There is something for everyone ages 1, 2, 3, 4, 5, 6, 7, 8, 9, 10, 11, 12, 13, 14, 15, 16, 17 years old and adults too! Fall Party Ideas – let’s get the party started! !